Ah, the weekend! Time to take a break from the work clothes and show off your casual sense of style. On days off, I love taking advantage of being able to wear trends I wouldn’t sport at the office. Sometimes a girl just wants to wear a funky graphic tee and distressed boyfriend jeans. These outfits are proof that comfy and casual can also be chic. Give your hair a rest from heat and styling. A loose, messy bun is perfect for the weekend – stylish, simple and sophisticated. Cozy up in an over-sized sweater paired with black skinny jeans or leggings. A faux-fur infinity scarf creates a glamorous look. Fall and flannel go together like peanut butter and jelly. For a sophisticated style, choose a plaid pattern that is subtle and incorporates neutral colors, such as tans and blues. Create this weekend-chic ensemble with distressed denim, a leather jacket and a knit infinity scarf. 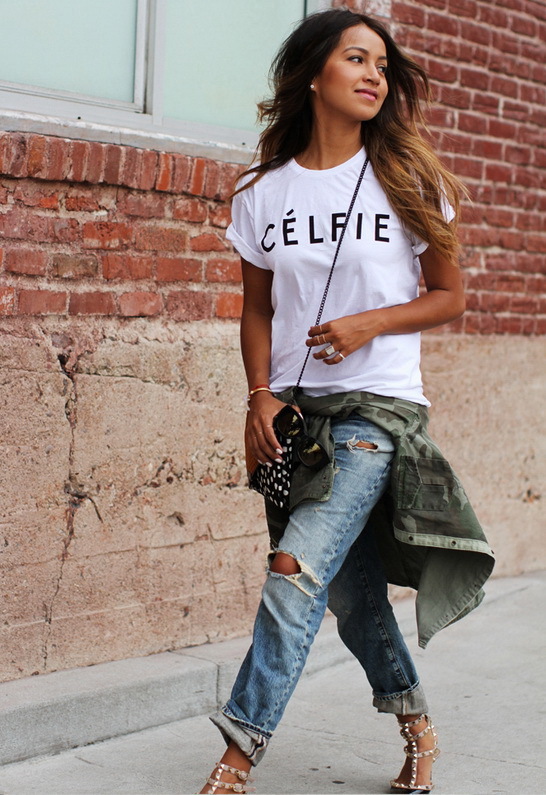 Graphic tees with distressed boyfriend jeans create a fun, laid-back vibe. The studded heels dress up the look, but fashion-forward flats would look great, too. The camo jacket and cross-body bag complete this trendy look.